President Francois Hollande arrived in Port-au-Prince with a commitment to invest $145 million into Haiti's economy. Although government and business sectors welcome Hollande's largesse, protestors with long memories about France's extorting $20 billion from Haiti as payment for its independence, are fuming. One protestor shared how many feel about France's wresting $20 billion in reparations for plantation owners' losses: "We Haitians know . . . a big reason why we are suffering today is because we were forced to pay France for our freedom . . ." An event coercing Haiti to pay ". . . ten times the country's annual revenues . . ." was a world-wide embargo led by the French in 1825. 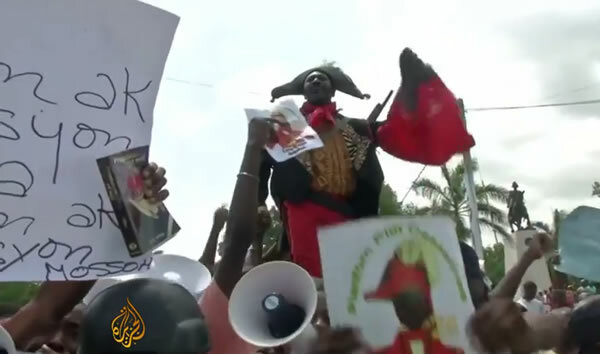 French warships threatened to bomb Port-au-Prince harbor if Haiti didn't pay up. Here is a picture of the Haitian Canadian writer Dany Laferriére as he was wearing his Academician suit while holding his Academician sword. He made his official entry as a member of the Académie Française on May 28, 2015. Haitian-Canadian author Dany Laferriere was selected to be one of the "immortals" in the Academie Francaise in 2013. Laferriere has produced a large of body of work, 20 novels over 30 years. The subject matter of many of his books is the experience of being an exile. He was introduced to the Academie in a formal ceremony on May 28th 2015 He says he is ". . . proud of being a writer." On Sunday, March 27, 2016, the Radio France Internationale (RFI) has introduced a new program in Haitian Creole and French which would be broadcast exclusively on its Haitian antennas. The program named "Koze Kilti" (Talk about culture, in Creole) is a 27 minute program under presentation of the Haitian journalist Dangelo Néard which would be broadcasted every Sunday at 1:30 p.m. and rebroadcast at 8:30 p.m. (Haiti time). It is a program produced in partnership with the French Institute in Port-au -Prince and recorded in the Institute's Port-au-Prince studio. The program will include local and international cultural news of the week from areas like literature, film, music and visual arts. Radio France Internationale (RFI) is available via the satellite bouquet Canal Sat Caraïbes. In Haiti, the program will be available on the following FM channels: Port-au-Prince (89.3 FM), Cap Haïtien (100.5 FM), Gonaïves (90.5 FM), Jacmel (96.6 FM) Jeremiah (92.7 FM) and Les Cayes (106.9 FM). Here is a picture of Amaral Duclona, gang leader in Cité Soleil, Operation Bagdad. Amaral Duclona, aka "Berthone Jolicoeur, is a charismatic Haitian who was born and brought up in the slums of Cité Soleil. He was the leader of a gang "chimeric", close to the former President Aristide and a foot soldier in the Aristide's terrorist army of Operation Baghdad. 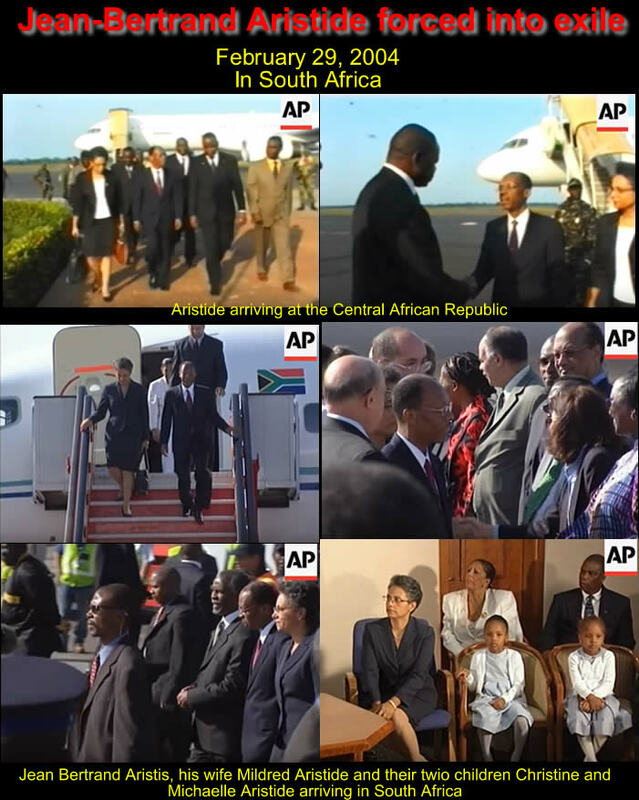 On January 6, 2004, Claude Bernard Lauture (Billy, 51 year old), a Haitian/ French businessman in the electrical engineering field, and a member of the Group of 184 (which was the most powerful coalition of "civil society" organizations in Haiti during the lead up to the 2004 coup that ousted Aristide), was abducted by gunmen while he was driving. A few hours later, his family received a ransom call of $100,000. The next day, his body was found riddled with bullets in Cité Soleil, the largest slum in Haiti. 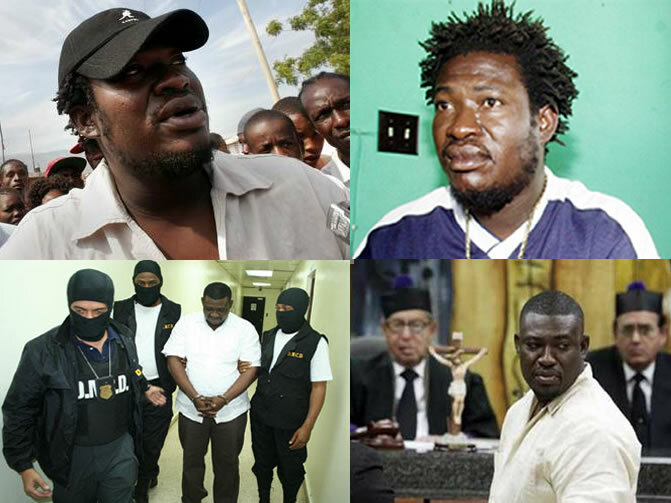 Duclona was arrested in September 2009 in the Dominican Republic and extradited to France in 2010; he was accused of kidnapping, forcible confinement and murder of Claude Lauture. In May 2014 during the first trial, the Court of Assise in Paris convicted Amaral Duclona to 25 years in jail. As per Billy's widow, Marie Louise Michele Lauture's statement, former President Jean Bertrand Aristide was behind the murder. On Friday, February 12, 2016, in the trial on appeal of Amaral Duclona, the Assize Court of Créteil (Val-de-Marne, France) has completely acquitted him of all charges as the court not get sufficient evidence from some of the key Haitian witnesses to testify against him. To publicly recognize Toussaint Louverture as one of the first in the fight to abolish slavery a statue was unveiled in his honor at the Museum of the New World of La Rochelle France. The city of La Rochelle played a very important role during the period of slavery. This great leader fought until his death for the abolition of slavery. 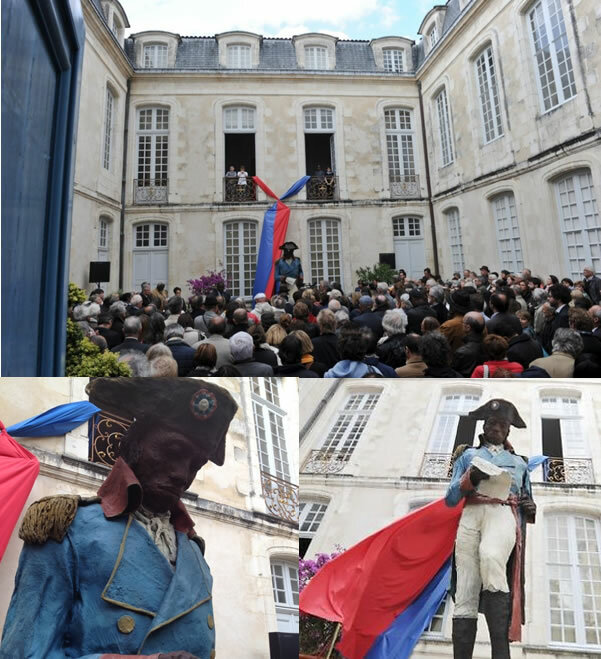 On Wednesday, May 20th, in the presence of the Mayor of La Rochelle, the Senegalese sculptor Ousmane Sow and a Haitian official delegation, a statue of Haitian revolutionary and a leader of independence, Toussaint Louverture (1743-1803) has been unveiled in the courtyard of the Museum of the New World of La Rochelle France. Toussaint Louverture (nicknamed The Black Napoleon) was a former slave, in 1801, promulgated an autonomist constitution for the colony, with himself as governor for life. But in the next year he was forced to resign by forces sent by Napoleon Bonaparte. The 2.80 meter high bronze statue in the costume of governor of the French Republic of Santo Domingo, is a tribute to him for abolishing slavery in the country. Toussaint Louverture died in 1803 in a cell in Fort de Joux (Doubs, Savoie). Look at this picture.  French government has a big load hanging on top of country. It is the Haiti debt that it owes and it involves restitution for the money the young nation was obligated to pay to France after they fought for their independence. Ironically, French president François Hollande who visited Haiti in May, 2015 stated that We have a moral not financial debt to Haiti". Two hundred years ago, when Haiti became the first independent black republic after defeating the army of then French Monarchy, it vowed to pay the French ruler, King Charles X an "independence debt of 90 million gold coins". The extorted bounty was distributed among the white slave owners for the loss of "property" they claim to have suffered as a result of the abolitionist Haitian Revolution. Thus, the country was forced to pay most of its national wealth to the French for own freedom. This barbaric ransom was collected between 1825 and 1947 through a French ordinance that threatened to re-enslave self-liberated Africans. This could be a good reason for present suffering of the country. 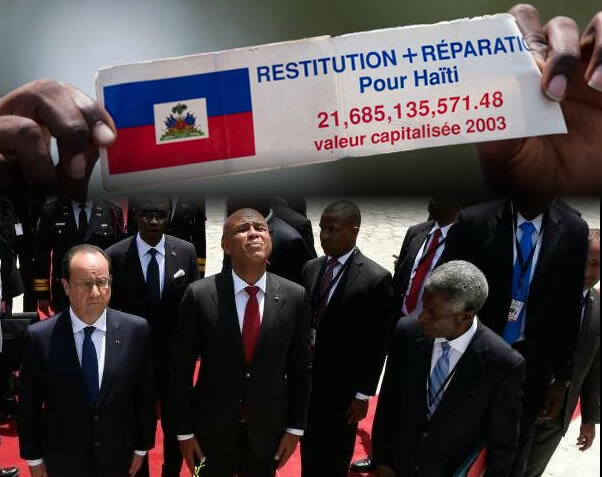 As per 2003 estimate, the Haitian President Jean-Bertrand Aristide demanded $22 billion from France as the cost of restitution. On Saturday, May 9th, during the inauguration of the Caribbean Centre of Expressions and Memory of Trafficking and Slavery (ACTE) in Pointe-à- Pitre, Guadeloupe, the French President François Hollande had said that "in Haiti, I will pay the debt we have." Although his announcement received a rousing applause from the audience, but according to the French National Palace, nowhere he had mentioned that France would be repaying the Haitian independence ransom of $23 billion (at present value). His statement indicating moral debt only without mentioning any monetary value was criticized in Haiti because the collection of the ransom for independence is undoubtedly an act of immoral and illegal turpitude. President Martelly has been under fire for agreeing with French President Hollande France need not repay $21 billion, extorted from Haiti as penance for claiming its independence in 1804. Hollande will, though, invest in projects, especially the Free and Compulsory Education program, with funding of 50 million Euros. Here is a view of a group of Haitians who were not so happy with the visit of Francois Hollande in Haiti in May, 2015. 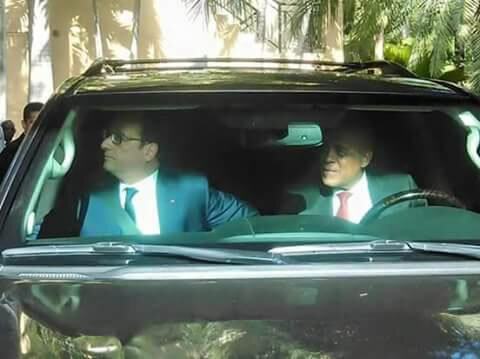 French President Hollande made a visit to Haiti recently. President Martelly glossed over France's unwillingness to pay reparations, readily accepting the $145 million in infrastructure projects from them. Protestors are frustrated Hollande, like other presidents of France, say it owes ". . . only . . . a moral debt . . . not financial compensation." France forced Haiti to pay $21 billion for an "independence debt" to guarantee its freedom in 1804. Here is a picture of some group of Haitian protesters demanding reparations during a visit of Francois Hollande in in Haiti. When Hollande and Martelly arrived at Champ de Mars to honor heroes of the Haitian revolution with a wreath-laying, 200 demonstrators came to voice their opinions on France's part in ruining Haiti's economy. Until the mid-20th century Haiti labored to retire the debt, but $77 million was still owing. France forgave the balance after Haiti's 2010 earthquake. Haiti is not France's only victim of blackmail. But Martelly understands if France pays reparations to Haiti, France would be pressured to recompense other countries it has stolen from. Martelly told Hollande ". . . no compensation can repair the wounds of history . . . . Haiti has not forgotten, but Haiti is not stubborn."